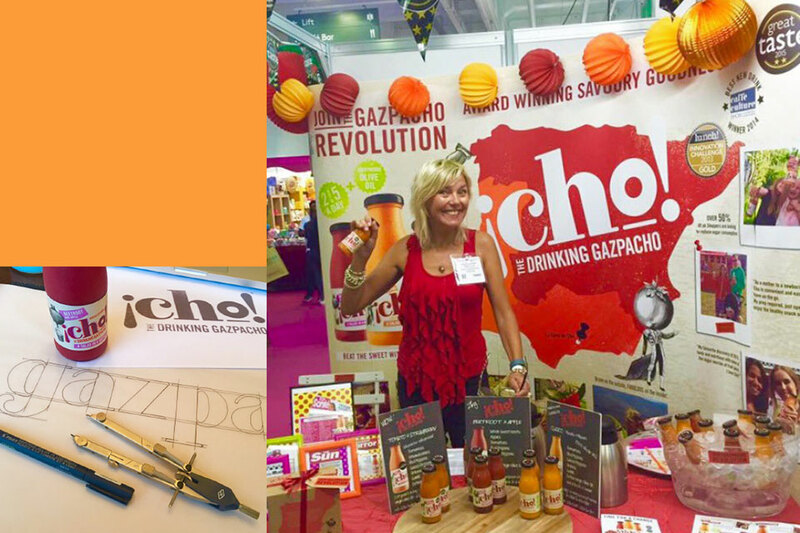 Gazpacho is known as ‘cold soup’, so the biggest marketing challenge was how to position it as an everyday drink to replace sugary fruit juices. 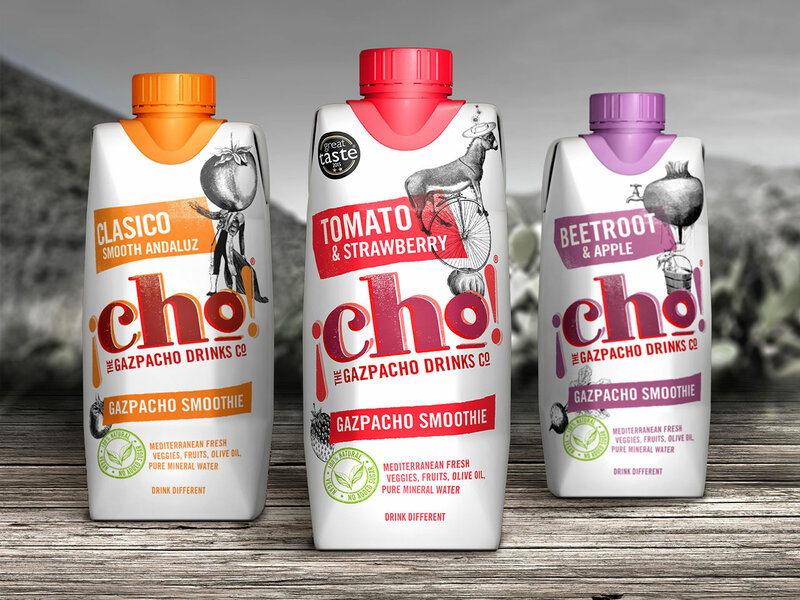 Our brief was to design packaging for the relaunch of this healthy Gazpacho range, creating a vibrant and distinctive visual language that would appeal to health conscious 24 to 45-year-olds. 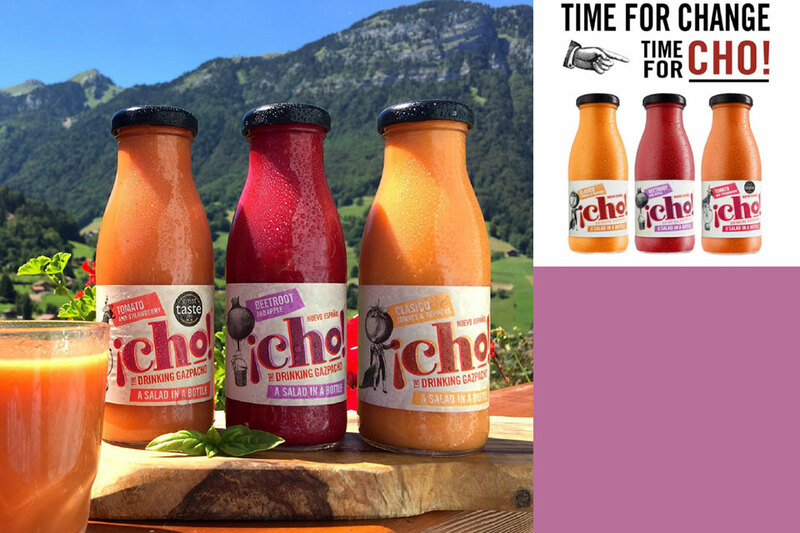 Brown&co have an equity stake in ¡Cho!, so throughout the process we have had a brand owner’s perspective on route-to-market and delivering growth. Of primary importance was to immediately communicate that ¡Cho! is a drink. So, using online VYPR quantitative consumer testing, we evolved the product descriptor from ‘A snack in a bottle’ to ‘Smoothie’ – grounding the product in a healthy drinks territory. 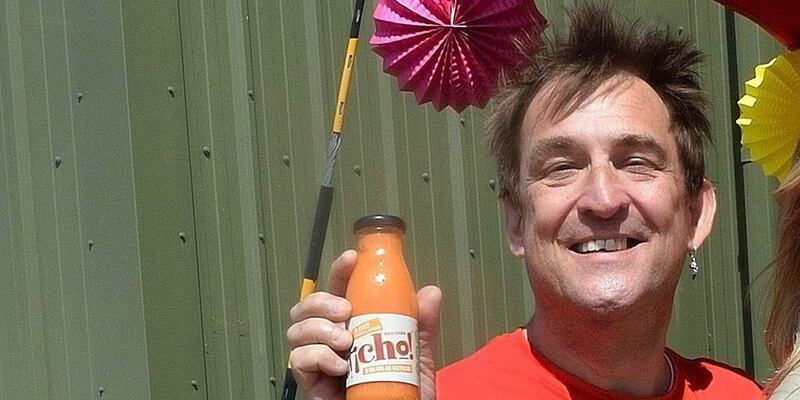 ‘The Gazpacho Drinks Co.’ further moves us away from soup. We also reviewed the pack format, choosing Tetrapak over glass bottles for on-the-go impulse purchases. As ¡Cho! 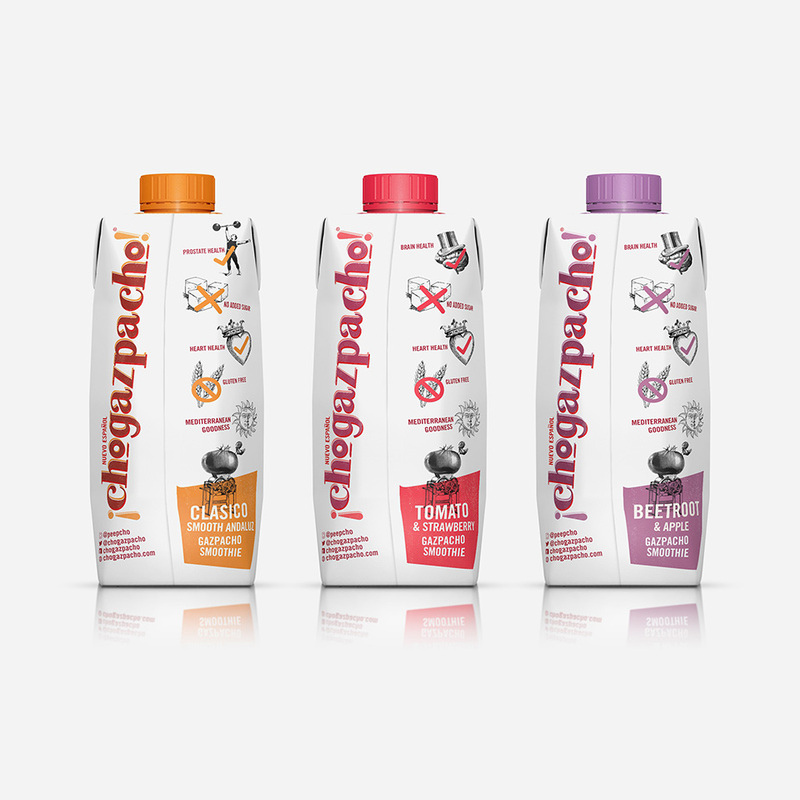 is all about ‘blending the rules’ of gazpacho, we chose a non-conformist DADA-inspired design style, also influencing back-of-pack iconography. 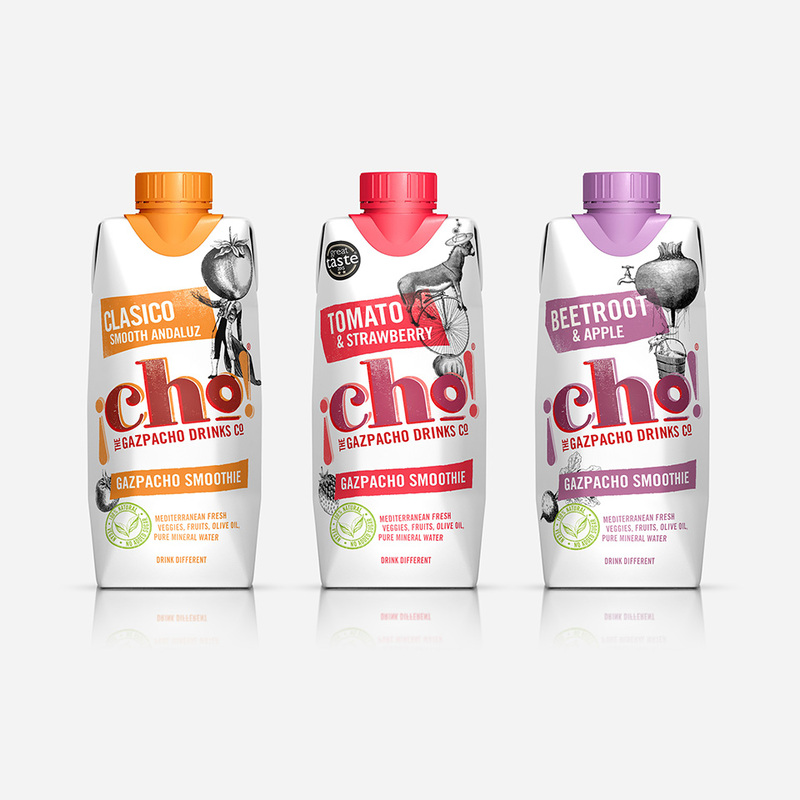 Our new packs better communicate a health story, with a clearer hierarchy of information, while the use of four languages opens up a wider international opportunity in mature gazpacho-drinking markets in Continental Europe. The innovative product formulation (first-to-market savoury smoothie) is grabbing the attention of retailers and drinks manufacturers, and is being seen as the ‘next big thing’ in better-for-you on-the-go nutrition. Our new packs launched in prime independent stores in the UK in May 2018, with ongoing negotiations underway with Sainsbury’s and Tesco.